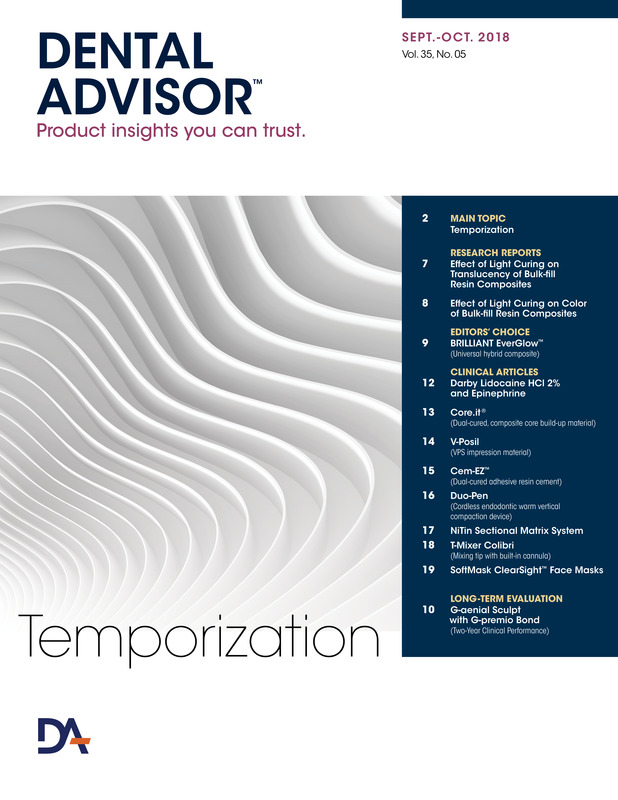 Trim the sectional matrix if it is too tall. I was able to place wedges AFTER the matrix and the ring, because the matrix pressing part is made of non-compressible polymer material. This is a very significant advantage over other systems. Make sure that you spread the rings a little wider so as to not upset the matrix and the wedge. Place the matrix band and ring, then the wedge to improve matrix stability and marginal seal. Double wedge and burnish the matrix band. Place the appropriate sized matrix band and wedge, then the proper sized ring and use a composite instrument to form a proper shape for the proximal area. This results in very little flash, if any. 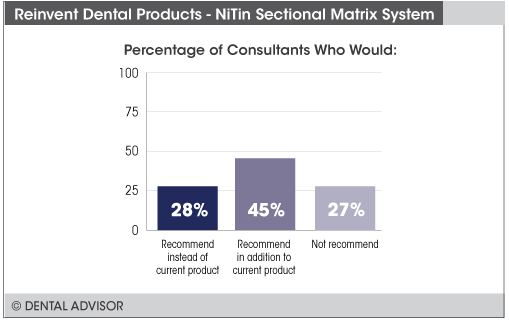 NiTin Sectional Matrix System was evaluated by 22 consultants and used in total 511 times. 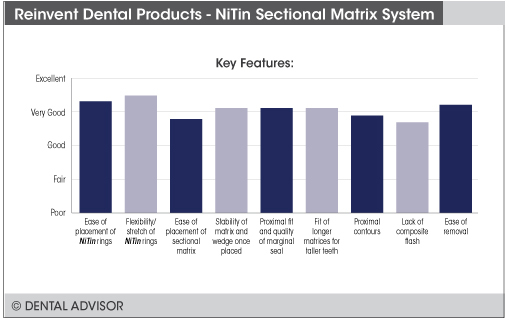 NiTin Sectional Matrix System consists of sectional matrices, rings, wedges, and forceps. 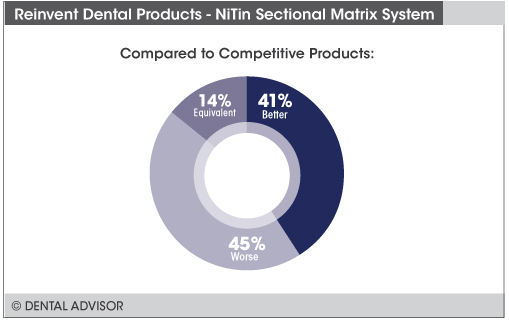 The NiTin rings are fabricated with drawn-wire nickel titanium (Nitinol) that has undergone proprietary heat-set processing to increase its strength and resilience, and polyether ether ketone (PEEK) reinforcement to reduce ring stretch. The ring placement forceps offer precise control during ring placement and the fully contoured sectional matrices are fabricated from polished, very soft 0.0015” stainless steel and are rigid to resist deformation. An easy placement tab is incorporated for matrix placement using the band forceps. The flexible curved wedges are designed with a curved tip to help the wedge glide interproximally to provide a marginal seal. 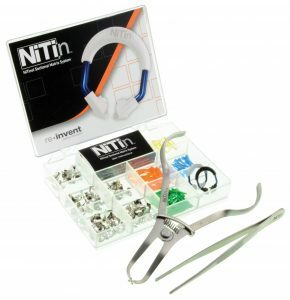 NiTin Sectional Matrix System is available in a starter kit containing 1 long and 1 standard NiTin ring, 100 assorted matrices (premolar, molar and tall molar, with and without extensions), 100 assorted wedges (xtra small, small, medium and large), 1 each ring placement, and band forceps. A mini kit containing 40 each of assorted size matrices and wedges is available, as well as packs of matrices, wedges and separate accessories.